In which shoe making and Chinese medicine come together to reveal to me a new perspective on health and resiliency. On the train to Portland I made shoes. "Are trains a way for you to access your subconscious," asked my friend Stacy. I had persuaded her to come along and get a hit of Portland while I was taking a boot making workshop. She was also eager to experience the famous Coast Starlight route. I did love train travel. It was a way to slow life down, feel the full affect of distance and be in motion outside of one's life and those chores which telegraphed me every time I sat down for three minutes. On a twenty hour train ride I had plenty of time to contemplate things. I did think it was possible that the rhythm of the train could put you into a theta state, much as a drumbeat allows the visions in a shamanic journey. I liked to think that JK Rowling had accessed this state when she was on the train where she had dreamed up Harry Potter. 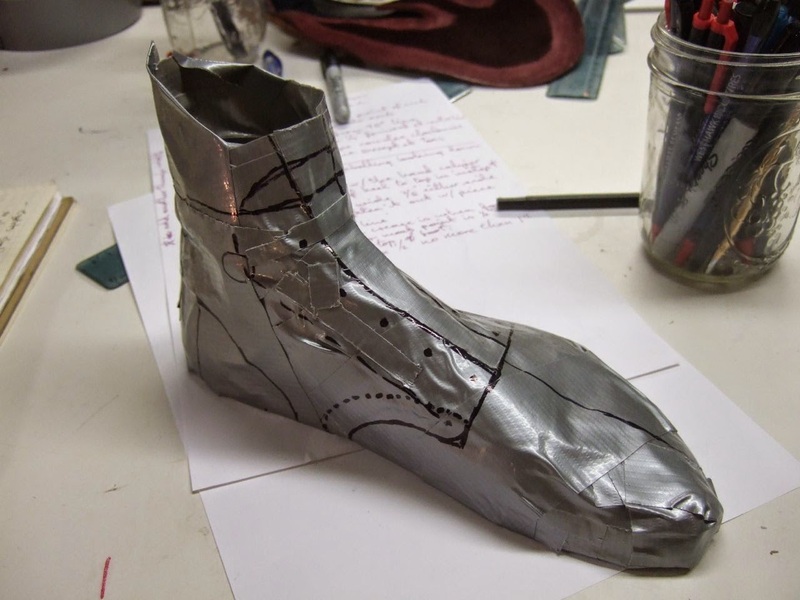 And as I worked on my shoe project (a slip on shoe using bicycle inner tube pieces for trim) I kept seeing myself traveling to make shoes and living on the train, possibly having a shoe workshop on the train. It was such a strong vision I wondered what I was meant to take from it. I felt it so clearly that it seemed a part of my identity, much like making shoes seemed somehow so right, so innate to me. The shoe in my hand made me feel masterful and working with hand tools seemed so familiar. I felt compelled to make things with my hands to fulfill some innate need as primal as eating. Perhaps it was cellular memory passed down from another generation. I asked my mother what profession her grandfather had had for I had heard it mentioned that he was a harness maker. "Well it's funny you should ask," said my mother "because my family didn't want me to know. And I was scolded for playing with his tools. I was told not to tell anybody what he did so I thought there was something wrong with him." I reflected on her childhood spent in the north of England in Yorkshire. Turns out my great grandfather was a horse shoer. And his children were so eager to better themselves that they didn't want to admit that their father did the work of a laborer. I thought it was cool though—an important part of history. I had seen a horse shoer at work. It was such a specialty profession now; they were part of the rich horsey crowd, paid well and in much demand. I knew how to pick up a horses foot and use a pick; like shoe making it was a similar feeling of getting to the bottom of things. I spent time wondering if those who loved to be crafty were expressing similar cellular memories of their ancestors making things by hand. Recently in the usual serendipitous way of my life I met an acupuncturist who saw me at Walgreen's getting into Catherine's electric car (the new Nissan Leaf) and he walked over to ask me questions about it. I didn't have all the answers so he gave me his card to e-mail him later. The card said that he specialized in ADHD, anxiety and depression. I was very intrigued. Weeks later I found his card still on my desk and contacted him hoping that he might refer some of his ADD clients to me. As it turned out I would be the one doing the referring because my mind was so much clearer after one session I immediately wanted everyone who had any chronic condition to see him, My mother went for her arthritis and so did a client to cut back on pharmaceuticals and her son for his allergies. I ran into the client in his office and she thanked me and told me how much he had done for her migraines. My mother too became so much calmer with the micro current technology he was using. And he told me how the micro currents enhanced serotonin levels. "Ah," I said, "so body chemistry can be changed without the use of pharmaceuticals." "Oh yes," he agreed, that being the whole point of his career. Dr. Kniskern, was not Chinese; he was a white American in his 50's who had begun his medical education at Stanford medical school (after he already got a degree in psychology and business). Given that the primary treatment tool of Western medicine was pharmaceuticals and after reading down the list of side effects he soon realized that he didn't want to practice medicine by pouring poison into people's bodies. A friend who was in Chinese medicine helped him enroll in another college where he could simultaneously study Chinese medicine. (Stanford, however, warned him sternly against following this practice saying that there were not enough studies to prove that it worked. Never mind that the body itself responded immediately to the techniques and provided a perfect feedback loop.) He graduated and set up his practice using what he learned from both disciplines then continued his education with a degree in nutrition & immunology and one in comparative medicine. Clearly a man in search of answers. He told me how he had used these tools of Chinese medicine to further develop his own treatment for Aspergers and Autism. Considering the complexity of these conditions I was indeed impressed. No one else had devised much of anything that worked for these kids. He had written a number of papers on his discoveries and treatments but the gate keepers of Western Medicine were so suspicious of such deviation from the norm that they refused to even consider publishing his findings. He was eager to demonstrate how the treatment might help me as I had mentioned that I had issues with high blood sugar. In the first session I could clearly feel the energy pulsing through my body. And what Dr. Kniskern referred to as brain fog was lifted. After a week of treatment my ability to get things done became a staccato military march driving me to tick things off my to-do list just for something to do. No longer did I dither and procrastinate. My mind was beginning to cannibalize my life sucking up my leisure time. When Dr. Kniskern next looked at my tongue he told me I needed to rest more. Take time out and let your mind wander he said. I had forgotten how to do that. He would also ask me what was stressing me out. Stress he pointed out would raise my blood sugars by using up my available insulin. I did a blood test daily when I woke up just to check if his treatments made any difference. It took a while but after three months my blood sugar levels are now consistently close to normal. After he told me about the impact of stress I began to see patterns. All kinds of things stressed me out including exciting things and what I read on Facebook when I woke up as when my Thai contacts had posted about the political shifts in my home country. What I posted to Facebook myself also had an impact akin to stage fright if something I said or posted was particularly risky. Things that I expected to stress me out did i.e. our renters not paying rent on time, Catherine being mad at me, and me not having enough client work. I discovered too that working with clients was so absorbing (and monetarily rewarding) it actually kept my mind from stressing me out. Shoe making and writing also calmed me. A friend who follows my various diverse interests told me that Tolstoy had also made shoes having decided that the peasants mental ease was a result of a life of toil and he hoped to counteract his despondency by taking up shoe and boot making as well as farming. I enjoyed thinking of Tolstoy renouncing his aristocratic roots and taking to the fields to toil alongside the peasants while making shoes in his leisure hours. That he was a writer made this exploration even more cogent to my interest. 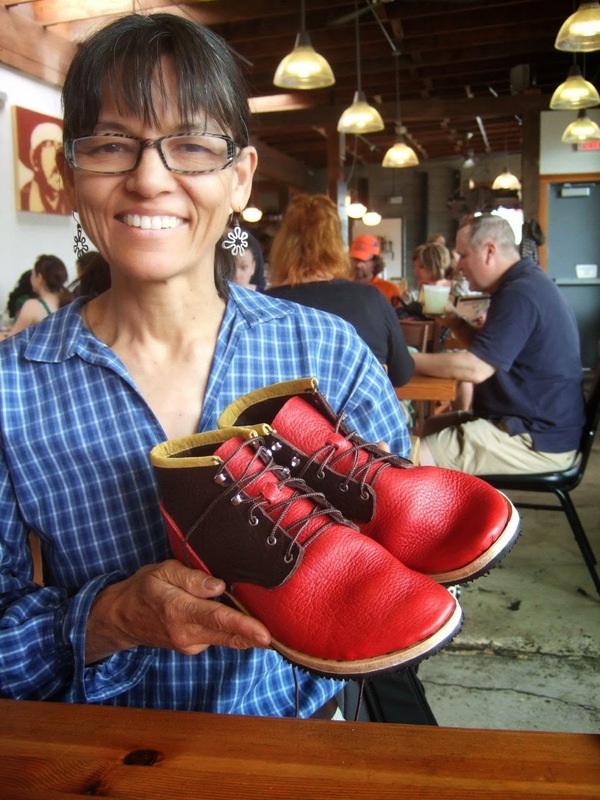 I had taken up shoemaking as an intriguing practical hobby, but making shoes not only fulfilled my appetite to make things with my hands, but kept me in the mental flow state that is said to be the ideal for the creative brain. I felt it strengthened my mind against interruptions and distractions. It was meditative in the sense that thoughts could come and go without attachment. To explore the depths of this new craft I was now ready to go to shoe school; they were few and far between and none in California. When I arrived at the shoemaker's house the next morning, I was thrilled to find that his house, too, was of interest with its front yard vegetable garden, rain water catchment system, adobe oven, garage workshop, chicken coop and rabbit hutches all in a space smaller than our own suburban lot. 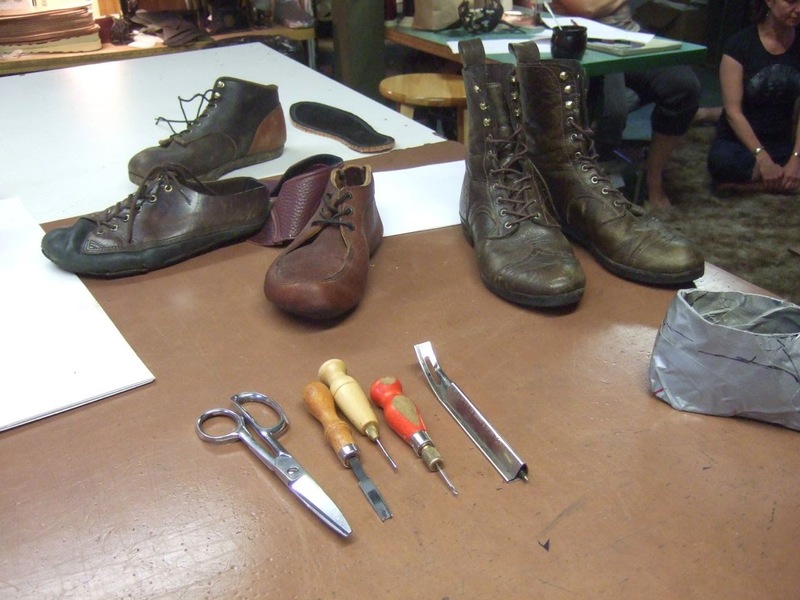 His basement shoemaking workshop sported four different vintage looking leather sewing machines and numerous hand tools slipped into a strip of leather loops nailed to the edge of a shelf full of shoemaking supplies. He had a book case of DIY homesteading books and peak oil books. The posters on the wall were from his gigs as a musician. Like me he was on a path to take life and what sustained life into his own hands. On the first day of class Jason showed us the five hand tools that were all we needed to make shoes—a pair of scissors, an awl to punch holes, a stitching awl, a skiver to shave off layers of leather and a channel groover to cut a groove in the sole where the uppers would be stitched into. He mentioned putting these tools into a backpack as he travelled. When I asked him later about these travels he said he used to hop freight trains and go to wherever there were art fairs, renaissance fairs or reenactment events where people would buy handmade shoes by artisans. He rode the rails! Now my vision of making shoes on the train made sense. I had been tuning into the traveling shoemaker part of his life. This was so remarkable I told Stacy about it that evening. I also asked him how he came to make shoes and he told me he started by repairing his own clothes, so often that the patches upon patches became works of artisanal art. Then he made clothes and learned to tan leather so he made pants from leather. It was only a matter of time before his shoes wore out so he made shoes from the leather too. At first the shoes only lasted a year or so, but bit by bit he learned how to make them last. Eventually he met another shoemaker and hung around at his workshop learning from him. This shoemaker was coincidentally the same man who started the shoe school in Ashland that I visited in Spring—the Bonney & Wills School of Shoemaking & Design. The school was beautifully appointed in a commercial studio full of natural light and a line-up of new looking sewing machines. It cost four times what Jason's workshop did and evoked too much the high end specialty consumer. I preferred the cottage industry feel of Jason's basement workshop tucked into a neighborhood of like minded homesteading neighbors where he made shoes to the sound of chickens using medieval designs that had a home spun ageless quality to them. I envisioned well fitting shoes that were available to everyone on a localized village level. In Oregon and especially in Portland there were many who shared these off-grid thoughts. But in the Bay Area, the land of high tech and innovation the very idea of making shoes seemed so odd that it stopped people in their tracks. I enjoyed their astonishment. It was anti-consumerist yet the way I was executing designs, my shoes were still a fashion statement. I was wearing my Roman sandals with metallic copper accents that included little Hermes wings on the sides that I made for my travels to Thailand last Spring. They were a big hit and no one once laughed at me for making my own footwear. When he saw them Jason immediately asked who had made them. My compatriots in boot making class were edgier and younger; one woman sporting scenic tattoos and large gauge ear piercings. A regular do-it yourself crowd—the two men were in the trades and the women well versed in DIY crafts and classes in pioneer skills. Next to them I felt downright mainstream in my wide brimmed white summer hat and a floral print summer shirt I'd made. I looked like I might shop at Nordstroms. I was intrigued by their sense of style as much as by their skill level. 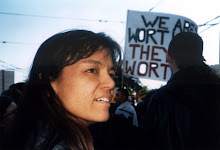 Hana (who had the tattoos and piercings) was a hydrologist working for the U.S. Geological Survey and Thadeus our farmer and handyman both made elegant work books of tobacco brown leather that wouldn't stand out. Andy who worked at his parents awning shop picked matt black leather bringing to mind Folsom street leather bars. He then trimmed them in silver grey edging which reminded me of a football team. Sara an art student who designed her own clothes picked the red leather and lined them with apple green. Pictures here. An entire day was devoted to making our pattern from duct tape casts of our own feet. Another was devoted to cutting out the heavy bison leather and prepping the pieces for assembly. I couldn't believe I spent three hours struggling to skive off the edges of the leather so the seam wouldn't be so bulky. I was hoping I would learn how to minimize my time. I would have given up right there, but it turned out that my tool had a crack in it that made it almost impossible to get it to work even though Jason could manage it. Then the sewing machine ran away with me and I broke a needle. Hand sewing the uppers to the sole in the stitch-under method was also challenging, but I managed a workaround by making the sewing holes slightly larger. I thought a lot about my design. I too wanted to use the red leather with its richly textured grain. I paired it with the chocolate leather to make a two toned boot like a saddle shoe. Then when I saw some yellow pigskin lining material I could use for piping across the top of the boot it really made the colors pop, while the natural leather of the sole still made it look like a shoe. Once finished with chrome eyelets and brown laces they looked like a real design reminding me of European children's shoes—butch, but playful. And the shape of the wide toe box were so pleasing to my eye that it gave me a curious sense of recognition as if I was seeing my home after a long time away. It was my feet I was seeing reflected in the shape of the shoe. Jason said that after we had made many pairs of shoes and were practiced in our craft these first pair would look crude. But though the stitching wasn't parallel and the seams were so bulky it looked like I could stand on the edges of the leather, I was awed by how nicely they turned out. This finished pair of boots made by my own hand gave me such satisfaction that I was filled to the brim with happiness and the awesomeness of it all. How was it that this four day accomplishment could be as satisfying as love? I marveled at this feeling of utter happiness having been harvested with my own hands and a few tools as if from the ground itself. I wore my red shoes to the restaurant where my hosts Don and Jerome took us after class and they were admired by the wait staff. My friends were equally impressed and later Stacy and her partner Peggy also wanted to try them on. There was something about them that compelled people to want to see what they looked like on their own feet. A couple of weeks later a masseuse, Catherine's new friend Kyna, came by to give us both massages. As I lay on her table in front of my bookcase she mentioned one of the books on my shelf and how much it had helped her long ago. I asked which story was it that most spoke to her and she said "The Red Shoes". So I took down Women Who Run With The Wolves which I never had the patience for before and read about the little orphan girl who made her own shoes and how she was adopted by a lady in a golden carriage and taught to dress properly and have manners. Turns out the little orphan girl was perfectly happy with her handmade shoes and when they were taken away from her something shut down inside her—the capacity to do things for herself, that wild self sustaining creativity. And out of this "soul famine" she yearned for the red shoes of her past and got herself into trouble with a new pair of red shoes that called out to her and were enchanted so that she eventually went to her death with her obsession with them. This soul famine sounded like something I had tried my damnedest to avoid. And then again maybe not. But I was glad I was again making my own little red shoes. The handmade life, this off grid attempt to become self sufficient I could see was also a form of mental self-healing just as my acupuncture sessions were making my body quicker to bounce back from stress. The term emotional resiliency comes to mind. Tolstoy was onto something. I let my mind breath in this resiliency and took a mental celebratory pirouette as I contemplated a life prioritized around the things that nourished the soul and healed the body. What a different world that would be.